Old-school role-playing games are full of reluctant heroes – scrappy loners who need a whole epic quest just to learn to care as much about others as themselves. Cthulhu is sort of like that. He doesn’t want to save the world. But he has to. Because saving the world is the only way he can destroy it. Cthulhu Saves the World looks and plays like an old-school RPG, but in case the title didn’t clue you in, it doesn’t take itself too seriously. Cthulhu is an evil creature worshipped by many, but when power dwindles, the only way he can get it back is by becoming a true hero. So he sets off in search of people to save, evils to fight, and lost puppies to find. He’s not really saving the world to make it a better place, though. He just wants to wreak havoc once again. Along the way he’ll join forces with an odd assortment of adventurers. There’s a young groupie who has a disturbing obsession, a senile old man who remembers absolutely nothing, and a talking sword. It’s a weird group, that’s for sure. And though the game is set in what appears to be a cliche fantasy world, you won’t be facing off against cliche fantasy enemies. 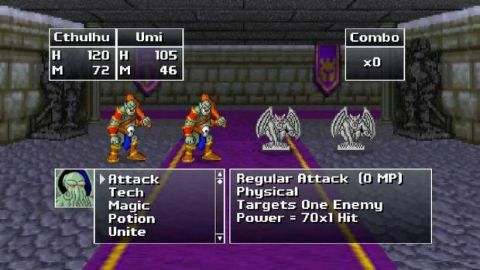 Sure, there’s the odd dragon to battle, but there are also zombie cheerleaders, green alien kitties, and some dude who’s covered entirely with belts. You know, Beltman. The gameplay itself is more traditional, with dungeons to explore, townspeople to chat with, and plenty of random battles to engage in. And finding your way through the linear storyline and world isn’t a chore. Even the dungeons, which attempt to trip you up with water puzzles and conveyor belts, are pretty simple to navigate. It’s satisfying, though. The battles are quick and challenging (especially if you play on the higher difficulty) and you are even given some freedom when it comes to how your characters evolve. Whenever they gain a level you’re given two options for how to upgrade the character. Sometimes this means picking between two different technical abilities or magic spells, and sometimes it means deciding which attributes will get a boost. It’s simple, but it works well. But even though it’s mostly traditional, Cthulhu Saves the World also eliminates many of the frustrating elements inherent to JRPGs. Yes, there are still random battles, but if you enter into more than 25 of them in any dungeon you’ll be given the option to turn them off. There’s also no backtracking because you can simply warp back to any town you’ve previously visited. Plus, you’ll earn back both health points and magic points after each battle. There are even one-ups to collect in case you die in battle. More important than all of those features, though, is the length. Not everyone has 87 hours to dedicate to an epic role playing experience, and Cthulhu Saves the World is made for those people. It can be completed in under 10 hours and if you really push through you can probably have it done in around six. It’s short by full-sized RPG standards, but it feels complete and never overstays its welcome. The Indie Games section of Xbox Live is full of crap, but there are also a lot of great games to be found. Cthulhu Saves the World is one of them. It’s for players who love RPGs, players who no longer have time for the genre, or even players who just want a damn funny game. It looks old but it packs more personality than most big budget blockbusters. Cthulhu may not want be a hero, but he’s helping to save a genre. It looks old but it packs more personality than most big budget blockbusters. Cthulhu may not want be a hero, but he’s helping to save a genre.